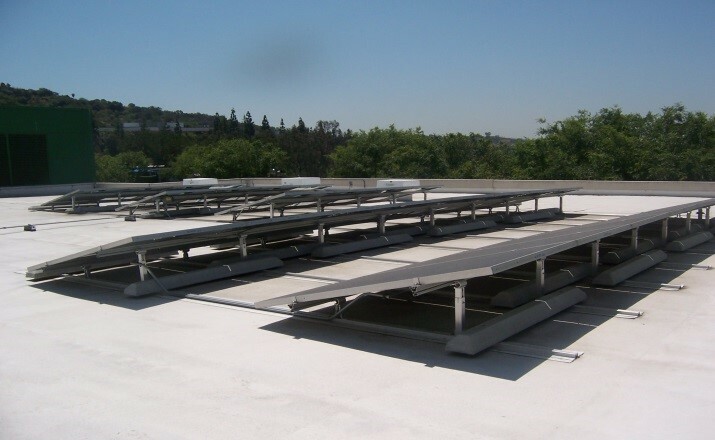 When the South Coast Air Quality Management District Building needed to replace an aging Hypalon roof, choosing the right replacement was critical, as it cost an additional $80,000 to remove and reinstall their existing solar systems. 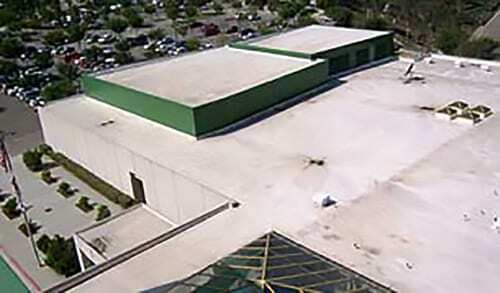 The AQMD chose the SureCoat Seamless Single-ply Roofing System. The South Coast Air Quality Management District building in Diamond Bar, California, is also the home of the city offices of Diamond Bar. This roof area is approximately 134,600 square feet. Click Here to view SureCoat Systems “Super Compliant” Product Profiles on the South Coast Air Quality Management District website. 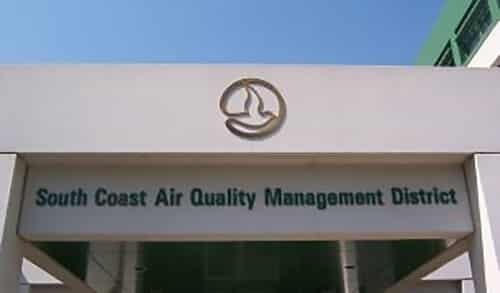 The AQMD is responsible for regulating and managing the air quality by limiting emission of fumes that are harmful to the population and the environment. This includes the use of architectural coatings. According to AQMD guidelines, SureCoat is a Super VOC compliant product with less than 1% VOC per liter. The existing roofs consisted of 14 year old Hypalon single ply roofing. Hypalon tends to wear as exposed to UV and sunlight. Many professionals in the industry believe that TPO and PVC single-ply roofs have similar wear patterns to Hypalon. Traditional single-ply roof membranes are easily reconditioned with SureCoat without a tear off that potentially adds toxic materials to our landfills. 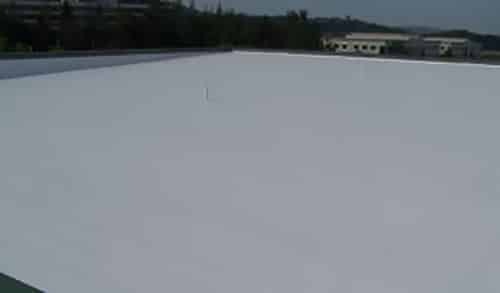 Large roof fields can be reconditioned with a single product, no black or colored emulsions are used, so there is no risk of dissimilar products to delaminate. There is no need to wait 30 or more days for an emulsion to cure or gas off before the project can be completed. The SureCoat Roof System is a durable seamless single-ply roofing system that is waterproof immediately after it has dried. 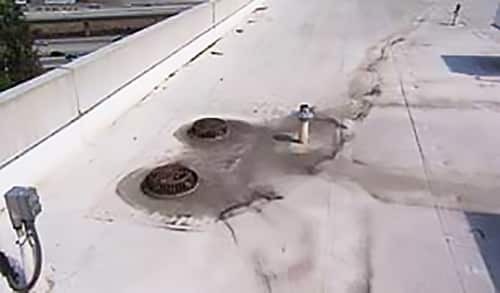 Even the best low-sloped roof systems have ponding issues with accelerated wear at these areas. 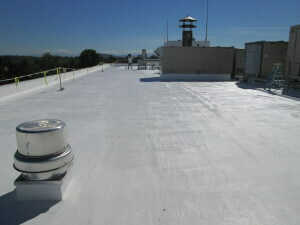 The SureCoat Roof System has a written manufacturer’s warranty that covers areas that have ponding water. It is the only single coating material that was designed specifically to protect against water and UV rays at the same time. This roof was easily prepared by cleaning with SureSkrub, a biodegradable roof cleaner and etching detergent and a floor scrubber with long bristles. The SureCoat Roof System is made from natural renewable resources that are Eco friendly in manufacturing and installation. The SureCoat Roof System will never blister, wrinkle or delaminate at drains and waterways, as other coating systems tend to do over time. By extending SureCoat and Poly-Mesh into the drain where it terminates directly into the drain pipe, then replacing the drain hardware over the new monolithic membrane, the numerous seams that existed with the old single ply roofing are eliminated. Water intrusion under the coating system at drains and waterways is an issue of the past! 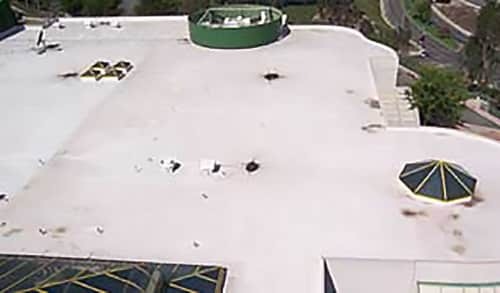 The SureCoat Roof System reconditioned this existing roof to a “better than new” condition with a written 15 year renewable manufacturer’s warranty that includes coverage for ponding water on this low-slope to flat roof. 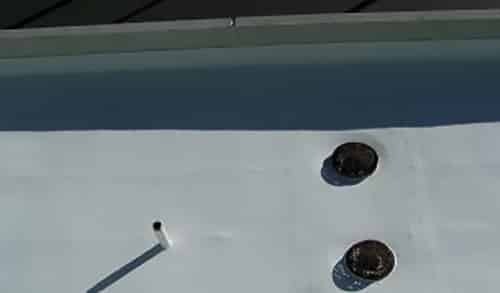 The SureCoat Roof System has single component epoxy resins and acrylic resins that create a cross linked molecule with a perm rating of .0025, making it impermeable to water moisture or vapor. This creates a sustainable roofing system that is excellent under solar panels and other roof equipment. SureCoat provides waterproofing from surface to substrate with a single white elastomeric product. The field of the roof with drains is now protected with a monolithic membrane. There are no seams to come apart; no fasteners, no penetrations, no adhesives. 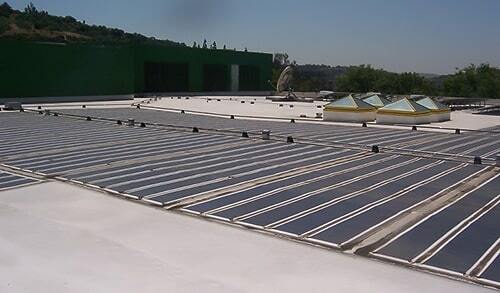 The SureCoat Roof System is resistant to pollutants, mold, mildew and most chemicals. The SureCoat Roof System has excellent adhesion to most substrates without a primer. 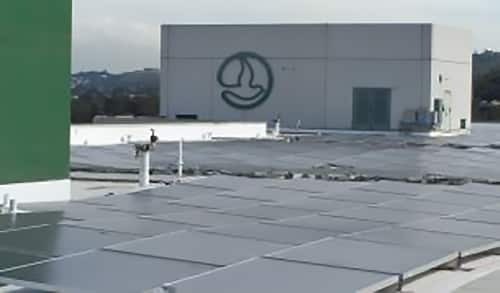 With proper maintenance, such as periodical cleaning, and keeping the condensation lines and drains operable, the SureCoat Roof System warranty can be renewed as long as this building is in use. The renewable warranty option makes SureCoat an easy choice. Future roof budgets can be estimated much lower than with traditional single-ply roofing systems. The SureCoat Roof System is the original seamless single-ply roofing system of the USA. SureCoat has 398% elongation to move with thermal cycles and uses no harmful chemicals in the process. SureCoat is also a CRRC rated, Energy Star approved and California Title 24 compliant. The SureCoat Roof System has up to a 93% thermal emittance and 91% Sunlight reflectivity, including 80% of UV rays; making it an excellent choice to partner with solar, as it optimizes the solar panels’ energy capture. 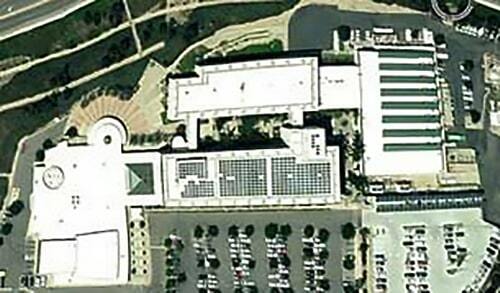 This existing solar system of the SCAQMD covers approximately 28,500 square feet. To remove and re-install a solar system this size runs close to $80,000, making roof performance critical! 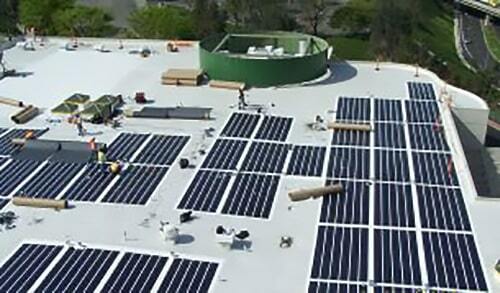 That is why the SCAQMD specified the SureCoat Roof System to install under their solar system. 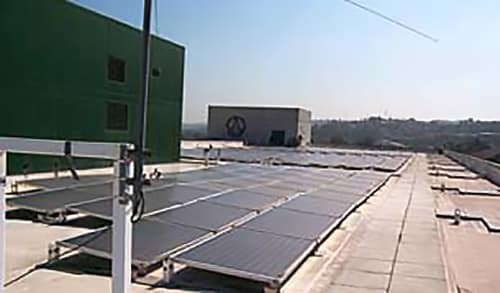 The SureCoat Roof System was installed on the SCAQMD in a specified dry mil thickness (DFT) so that the life cycle of their roof is compatible with the life expectancy of their existing solar panels and new solar systems. The SureCoat Roof System is a solid core of elastomeric roofing material reinforced for 2800 psi. As it wears it remain a cool roof by emitting up to 93% of heat back into the atmosphere and reflecting 88-77% of UV. A SureCoat roof retains its thermal values, remaining a cool roof for the entire warrantied period. In the case of the SCAQMD, 15 Years. The cleaner a SureCoat Roof is, the higher the reflectivity is. 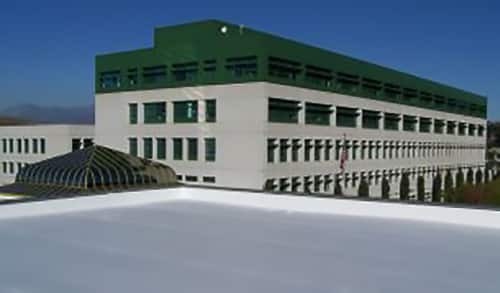 High reflectivity reduces the deterioration of the single-ply roofing membrane, extending the life of the system even longer. The cooling cost savings is realized in the thermal emittance by reducing heat transfer and radiant heat effects into the interior of the buildings in Diamond Bar, California. 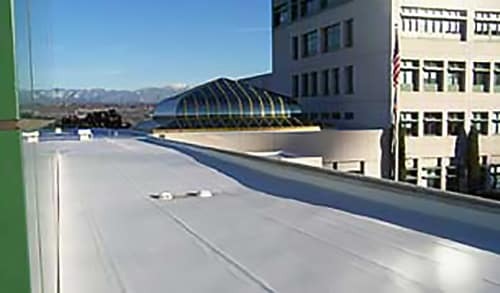 The SureCoat Seamless Single-ply Roofing System is a self-flashing, sustainable roof system that can fortify any existing single-ply roofing system without any penetrations, special hardware, adhesives or heat welding. SureCoat reconditions the existing flashings while incorporating them into the monolithic membrane of the roof field. 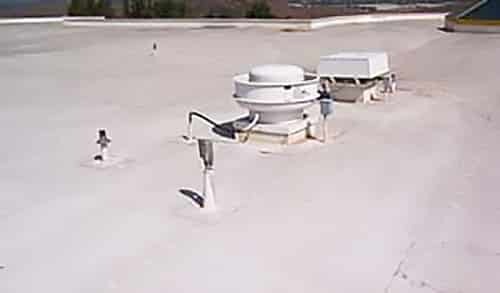 HVAC duct work and plenums can also be reconditioned at the same time as the roof with the SureCoat Roof System. 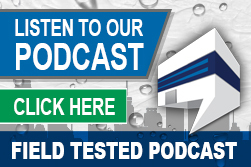 Call 877-823-7873 to speak with an expert, for a material list, quote, specifications or samples.